CHI regularly sponsors workshops on Demystifying Designation. Here are the presentation slides from the November 2018 workshop. The Calgary Inventory of Evaluated Historic Resources is a list of places that have been evaluated by the Calgary Heritage Authority and have been formally acknowledged to have significant heritage value to a community or to the city as a whole. There are currently more than 800 properties on the Inventory, which is updated on an ongoing basis. Listing on the Inventory makes important information about the heritage value of a place available to owners, developers, government bodies, and others. Learn about the inventory and criteria for listing here. Some of the sites on the Inventory are legally protected against demolitions or inappropriate changes by also being designated as Municipal Historic Resources or Provincial Historic Resources under the Alberta Historical Resources Act. Municipal Heritage Resources include City-owned properties, properties whose owners have requested this legal protection, and properties whose owners have accepted it in exchange for receiving other benefits such as higher density allowances. Provincially, a site may be granted Provincial Historic Resource designation if it is associated with an important aspect of Alberta’s natural or human history, is of outstanding provincial significance, is in its original location, and retains the physical site features necessary to convey its significance. Visit heritage conservation and protection in Alberta, for more information about provincial designation, the criteria for listing and the step by step process. National Historic Sites are “places of profound importance to Canada.” There are more than 950 National Historic Sites; of these, 167 are administered by Parks Canada. Calgary’s National Historic Sites are the Allen (Palace) Theatre, City Hall, Beaulieu (Lougheed House), Fort Calgary, Heritage Hall on the SAIT Campus, Mewata Armory, and Old Stephen Avenue. Learn more at National Historic Sites. While Calgary has no sites on UNESCO’s World Heritage List, it is worth noting that of Canada’s 16 sites, five are in Alberta: Canadian Rocky Mountain Parks, Dinosaur Provincial Park, Head-Smashed-In Buffalo Jump, Waterton Glacier International Peace Park, and Wood Buffalo National Park. 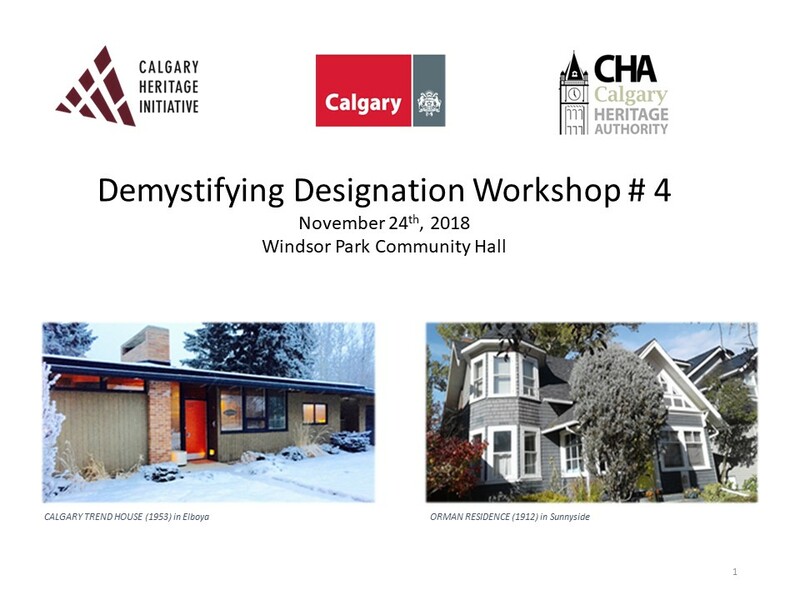 If you are aware of a place that is not yet recognized as a historic resource but you believe should be, please confer with the City of Calgary’s heritage planning staff. You can also visit the Calgary Heritage Authority (CHA) website to learn more about the inventory and evaluations here.